Gareth Bale will start for Wales against Bosnia-Herzegovina in Saturday's Euro 2016 qualifier, manager Chris Coleman has confirmed. Bale, 26, suffered a calf injury in September but returned as a substitute for Real Madrid on Sunday. Wales will qualify for the Euro 2016 finals in France by securing a point in Bosnia or at home to Andorra three days later. "We never risk players. 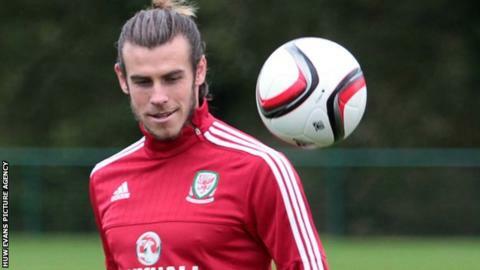 Gareth is fit to start," said Coleman. "He gets all the headlines, and when you are a great player that is what happens. "He has scored the majority of our goals but it is a collective thing, we have only conceded twice. It is not his fault he has the spotlight on him but we have a great group, great togetherness and he buys into all of that. "He knows it is not all about him. We are lucky to have him. He is all about the team and putting it first but I will be happy if he gets the headlines again with a goal or two tomorrow." Wales, who have not reached the finals of major tournament since the 1958 World Cup, are a point clear at the top of Group B, with the two highest-placed teams qualifying automatically for Euro 2016. One more point would guarantee their place in France next summer, though they could lose both their remaining games and still qualify if Israel fail to beat Cyprus and then Belgium. With Wales at home to Andorra - who have never won a competitive game away from home - three days after their game in Bosnia, Coleman says Bale is unlikely to play 90 minutes in both matches. But the Wales manager insists that will be his own decision, having received no instructions from Real Madrid. "We have had no information to say he can only play 30, 45 or 60 minutes," he added. "We do not take chances with players. If he was a doubt that he could not start then he wouldn't. "We know there is a lot at stake but we would not risk him. "I am not sure he is fit enough for 90 minutes but we will monitor how it goes. We have two games in four days which is tough so he is unlikely to play 90 in both."